Global Escalators & Moving Walkways Market size was estimated over USD 15 billion in 2017 and will exhibit growth of over 4% up to 2025. Demographic changes across the globe is driving the escalator & moving walkways market demand largely. Middle income class and aging population is growing rapidly with people aged 60 and older constituting around 12% of the global population, and is likely to reach almost 22% by 2050. These two factors will subsequently increase the demand for accommodation and infrastructure facilities, thereby increasing the demand for new equipment, modernization and maintenance of transportation equipment. Thousands of buildings are being refurbished and modernized every year to utilize more modern technologies. Major companies have developed special range of modular modernisation kits to provide new installations at low costs to give a better design, more safety and efficiency that will increase accessibility and mobility of elderly people. Mushrooming of airports and shopping malls driven by improved living standards, rising tourism culture, as well as globalization of businesses will significantly drive the escalators and moving walkways demand. In 1958, the first moving sidewalks were installed in the ‘Dallas Love Field’ terminal. Such facilities act as a connector between terminals to provide safe and smooth transport and enable commuters with heavy luggage to reach a speed of around 10 km/h on foot, thus saving the time and safety to travel within the facility. China is undergoing construction of the biggest airports in the world. Similarly, in huge shopping malls moving walkways or travelators are used to transport shoppers with their trolleys in the store. The growing infrastructural development throughout the world will spur the escalators and moving walkways demand. The global escalators & moving walkways market will come across a few restraints owing to its higher capital & maintenance cost. This is due to the eco-friendly and sustainable design, modern and upgraded technology and superior features of the mechanism. Increased production cost of the product will restrict new entrants in the market and the high initial investment and set up costs will lead to a limited penetration in the market. The escalators & moving walkways market is segmented on the basis of product as escalators and moving walkways. Parallel, multi-parallel and other escalators such as criss-cross, spiral, etc. are some of the subsegments of escalators studied in the report. Escalators accounted for approximately 80% in overall industry. Parallel escalator segment revenue surpassed USD 6 billion in 2017 and is said to grow with a CAGR close to 4.5%. Moving walkways is a dynamic conveyor system that enables people to move from one place to another across a horizontal or inclined plane over an immediate vicinity. They are commonly used in larger airports passageways to commute between concourses and the terminal. Growing application of moving walkways in supermarkets, public transport, theme parks etc. is said to gain steadily in the coming years. 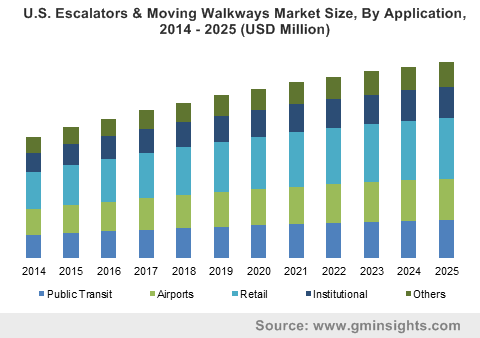 The application areas of the global escalators & moving walkways market include public transportation, airports, retail (shopping malls, hypermarkets), institutional (offices, colleges, hotels, hospitals, etc.) and others such as leisure and recreational complexes, sports complexes, etc. 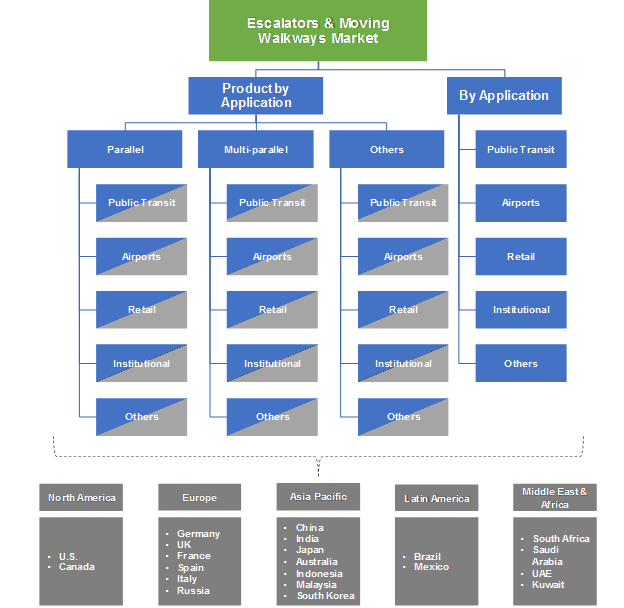 Airport application segment is said to hold the second largest industry share in the escalators & moving walkways market. Based on revenue, the segment will exhibit growth with over 4% CAGR in the forecast period. Retail segment was adequately valued over USD 4.5 billion in 2017 and is said to grow at a considerable rate from 2018 to 2025. This segment consists the rapidly growing number of supermarkets, hypermarkets such as Marks & Spencer, Sainsburys, Tesco, etc. Considering revenue, Asia Pacific held second largest industry share of over 35% in the global escalators & moving walkways market due to strong industrial, construction and manufacturing activities in this region. In 2017, China held a market share of close to USD 4 billion and exhibit growth with over 5% CAGR during the forecast period. Europe held a market share of over USD 5.5 billion in the global escalators & moving walkways market. The parallel escalator segment in U.K. accounted for more than USD 400 million in 2017 and is said to grow with a CAGR of close to 4% over the forecast timeframe. The region will showcase growth at a fair rate owing to the presence of end-user industries such as manufacturing, institutions, and building & construction. Prominent players present in the global escalators & moving walkways market include KONE Corporation, Otis Elevator Company, Schindler, Mitsubishi Electric Corp., Fujitec, Thyssenkrupp AG, Hitachi Ltd., Hyundai Elevator company, Toshiba Corporation, Sigma Elevator Company, Stannah, Sicher Elevator Co., Ltd., Kleemann Hellas SA, Stein Ltd, and Gulf Elevator & Escalator Co. Ltd. to name a few. In 2016, KONE corporation, completed the acquisition of Thyssenkrupp Hissit Oy, a Finnish subdivision of Thyssenkrupp AG, specialized in elevator and escalator maintenance services. The acquisition of Thyssenkrupp Hissit will complement its operations in the Helsinki, Turku and Tampere regions and facilitate the company to strengthen its place in the Finnish market. Escalators and moving walkways industry is consolidated by a handful of companies. Several major enterprises have invested millions of dollars in research and development, and by now have adopted highly advanced 3-D modeling systems and computer-based data network. Further, the demand for new installation market for escalators and moving walkways is highly correlated to the construction activities. Emerging markets in Southeast Asia such as, Thailand, Indonesia, Malaysia and Vietnam are investing in new projects, mostly related to urban transit. Maintenance business is a major source of revenue and recurring income for the escalators and sidewalk industry.